One of the latest trends in the hair world is balayage. We have many requests for this hair service and wanted to educate our clients in this technique, so you can see if it is the right process for you! Balayage is a freestyle way of hair lightening. Your hair stylist free hand paints lightener where they see fit to best compliment your skin tone & hair style. During this technique foils are typically not used. 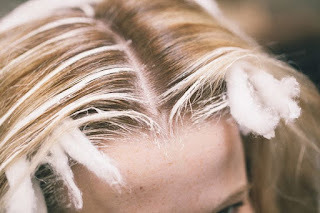 The stylist uses a sweeping motion to fully saturate the strands with lightener, then they will place either plastic wrap or cotton to prevent the lightener from bleeding onto other hair. This technique very often gets confused with Ombre. The ombre is a hair style that gradually shifts from darker at the roots to lighter at the ends. You can use the balayage technique to get the end results of an ombre. Balayage highlights mimic natural sun kissed highlights. These highlights can be a bit more spread out compared to the typical foil highlights. As the balayage grows out, the line of demarcation won't be as harsh, but your root may seem a bit darker than usual. The reason the root is a little darker is because there is less color definition at the root area. 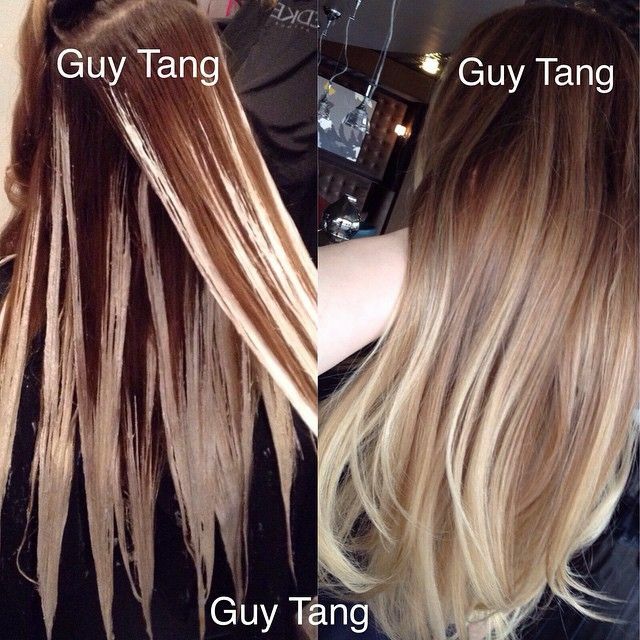 This photo is from hair stylist Guy Tang. Balayage is typically lower maintenance, since the line of demarcation (roots) isn't as harsh. The effects of balayage will give you the freedom to allow more time in between lightening. But keep in mind the more highlights you want the more upkeep it'll be. Talk to your stylist about upkeep when it comes to your hair in particular. We are all different. Come into Serenity for a consultation to see if this technique is right for you! **all images found on google.